It is not a simple task to own and manage a restaurant in the modern world. Several issues can arise when you ignore the factors needed to run a successful restaurant. These problems can be detrimental to your restaurant’s success. One of the complications of your having own business in the restaurant industry is the constant need for upgrading or replacing equipment. Purchasing just a few necessary items can devastate you financially. However, without these items, your chances of success are going to diminish. It is the mission of the people at Chef’s Deal Restaurant Equipment to provide you with both affordably priced and high-quality used equipment. We firmly believe in the fact that the optimal product is both cheap and efficient. Also, we believe in serving you with the best in quality of second-hand restaurant gear. We inspect all our used equipment to certify that they are working to a full compacity. Our extensive list of equipment is in excellent shape and come from creditable companies. 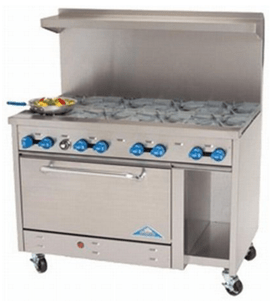 The assortment of restaurant equipment broadly ranges from gas charbroilers to door coolers. The collection stems from an array of different providers and manufacturers. Hussmann, True Food Service, Hobart, and Beverage Air are a few of these manufactures which are renowned for their high-quality products. Chef’s Deal Restaurant Equipment’s prices are the most affordable that you will find. The range of price regarding the restaurant equipment may vary from item to item. However, we reassure you that our prices are reasonable. We have products that go as low as the two thousand mark. You will literally bank thousands of dollars in the process of buying our used equipment. Here at Chef’s Deal Restaurant Equipment, we take the delivery process seriously. Our delivery time is both quick and reliable. A majority of our collection of equipment includes free shipping. With the delivery fee included in our prices, our equipment is even more affordable then ever. This is for restaurant equipment that is equally as functional as something would buy brand new. In regards to payment, we have some options available for you. You can choose to pay front up or pay in increments over a fixed period of time. Simply checkout our website and get an easy and quick quote upon request. With our quote service and payment options, you will know how much you will have to pay. Also, you may start creating revenue using your second-hand restaurant equipment even before making your first installed payment. To wrap things up, here’s a brief recap. It is tough to run a restaurant in our world of modernism where technology is in constant need for upgrading or replacing. Buying brand new restaurant equipment can be financially devastating. However, buying second-hand equipment that functions just as well brand new equipment can safe you a small fortune. Chef’s Deal Restaurant Equipment offers a broad range of high-quality and affordable products with a short delivery time. We have payment options that are available upon request.